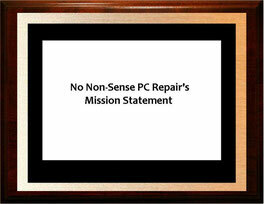 No Non-Sense PC Repair is here to provide the Highest Quality Desktop/Laptop Repair for Home and Small Business users at a fraction of the price of other "fix-it" companies. The customer is our first priority. Our goal is to be transparent in fixing the problem, and honest about the time and cost it will take to resolve your issue. Our customers can be rest assured that we can fix your computer right with No Non-Sense.